Coffee With Games: Metroid Prime Trilogy turns 3! How many hours have U.S. Wii owners reported playing it? 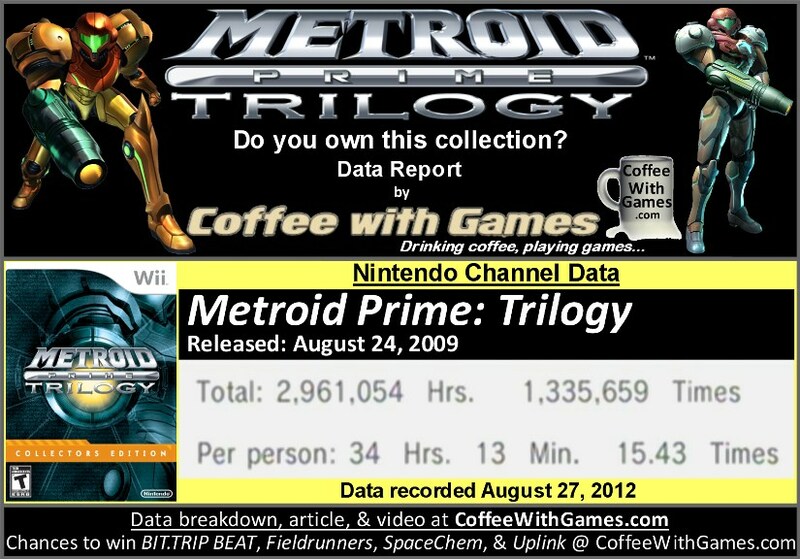 Metroid Prime: Trilogy now has approximately 86,562 U.S. Wii owners that have reported game-play hours through the Wii's Nintendo Channel, with 1,099 days possibly reported. The game has about 8,955 more Wii owners now that have reported data, since the report last year. Trilogy's play-time per day/session is now 2 hours 13 minutes, and the game's overall reported average is one hour more than last year, sitting at 34 Hours 13 Minutes as the image shows. What about the critic and customer review score averages over the last year? The "professional" critic review score average is still 92.27%, based on 33 reviews on GameRankings.com. The customer review score average has changed slightly though, and is now at 96.00% for the game, based on 115 customer reviews on Amazon.com. As for the reported data, the overall reported "Total" hours and the average hours "Per person" have increased less than I expected them to over the last year. I thought that perhaps players would completed two of the Metroid Prime games on the disc by now, and that the average would be sitting closer to 40 hours "Per person". I assume that completing two of the Metroid Prime games should take about 40 hours "Total", 20 hours for each. Seeing how much the "new" and "used" prices are for Metroid Prime: Trilogy online, I find it odd that Nintendo hasn't reprinted the collection. As I said in the recent "Metroid Prime 3: Corruption turns 5!" post, I think Nintendo should at least add Metroid Prime 3: Corruption to the Nintendo Selects games, and if Nintendo doesn't add Metroid Prime 3: Corruption to the Nintendo Selects lineup, having the Metroid Prime games available to purchase on the Wii U's eShop when it launches this year I think would be a great alternative, and a great reason to purchase the Wii U day one for fans of the Metroid Prime games. If you are looking for information on how to enter the games contest/giveaway, you can find that post HERE. If you are already entered in the contest/giveaway, you can get an extra entry by tweeting out this post using the "Tweet" button below and adding @CoffeeWithGames to the tweet; you can also get an extra entry by liking this post on the CoffeeWithGames Facebook page HERE. Do you think Nintendo should add Metroid Prime: Trilogy to the Nintendo Selects lineup? If you own Metroid Prime: Trilogy, how many hours have you gotten out of it, and have you completed all three games on it? I actually own Metroid Prime on the GameCube, but only played it for about 20-30 minutes and never picked it up again. I enjoyed MP3 so much, that when I heard about the Trilogy releasing, I traded off MP3 very quickly to get the most for it at the time. I believe the Trilogy was around $70 used at Gamestop one time I was in there over the past few years, so yeah, $19 is a pretty great deal. I'd also like to see them re-print or add them to the selects line-up. For now 'Other M' will have to do.